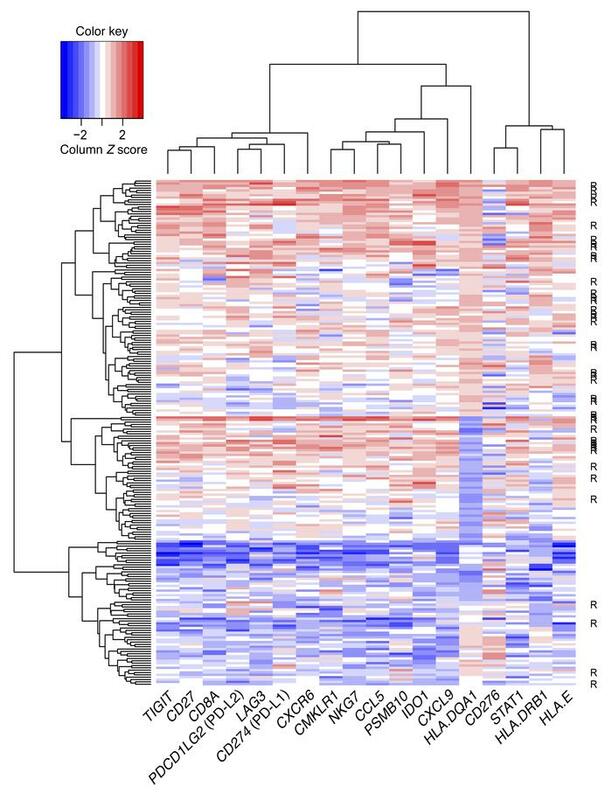 Heatmap for the final 18-gene T cell–inflamed GEP for 216 tumors from patients in KEYNOTE-012 and KEYNOTE-028 considered evaluable for objective response. Rows represent patients and columns genes. Expression levels have been standardized (centered and scaled) within columns for visualization. The “R” on the right side indicates whether the patient was a responder (by central imaging vendor in KEYNOTE-012 and by investigator assessment in KEYNOTE-028). The rows and columns have been grouped using unsupervised clustering.